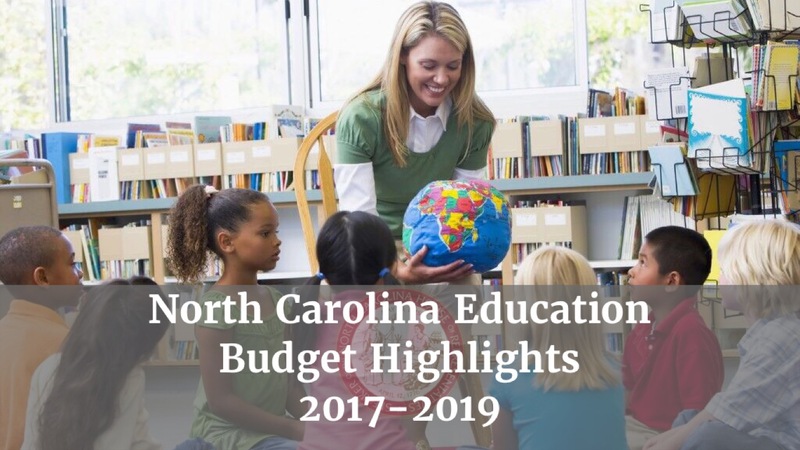 Raleigh, N.C. – North Carolina’s 2017-2019 education budget includes a net increase of more than $818 million dollars and a fourth consecutive teacher salary increase by the state General Assembly. Every current teacher will see an increase in their pay, and starting teacher pay is $35,000. Teachers in North Carolina will receive salary increases averaging almost 10% by 2019 after the fourth consecutive teacher pay raise from the Republican-led General Assembly since 2014. Assistant principal salaries will increase an average of 13% and principal salaries will increase an average of 9% by 2019. Teachers with 25+ years of experience will receive a bonus of $385 in both 2017-18 and 2018-19. North Carolina had the fastest rising teacher pay in the nation since 2014. North Carolina’s state-funded average teacher pay is increasing by 7.2% over the next biennium compared to the national average 2% increase. Non-certified and central office personnel will get a pay raise of $1,000 in the budget biennium. Third Grade Read to Achieve Teacher Bonuses, AP/IB/Cambridge AICE Teacher Bonuses, Career and Technical Education Teacher Bonuses, Math & Reading Performance Bonuses, Teacher Assistant Tuition Reimbursement Program, Initial Teacher Licensing Fee Reimbursement, Teach for America, Salary Supplements for Highly Qualified Graduates and the N.C. Teaching Fellows program. The 2017-2019 budget adds $11.2 million of additional funds for textbooks and digital resources, and $2.4 million for the state’s digital learning plan. Streamlines spending to classrooms by reducing N.C. Department of Public Instruction costs 6.2% and 13.9% over the next 2 years, and reducing central office administration by 7.4% in first year and 11.6% in the second. Gives the Superintendent of Public Instruction $1,000,000 to audit his department and funds 10 new positions within his office. Provides $4.9 million to expand Career Technical Education programs to 6th and 7th grade students in select school systems. Funds $6 million of the At Risk Allotment each year to support extended learning and integrated student support services for at-risk students. Provides over $6 million to raise the funding cap for students with disabilities. Creates an Education Savings Account program for students with disabilities to receive up to $9,000 in scholarships. Appropriates additional $30 million to Opportunity Scholarships for low-income students. Provides all Cooperative and Innovative High Schools with supplemental funding. Adds 3,525 additional Pre-K slots. Changes the Achievement School District’s name to the Innovative School District (ISD). Creates Joint Legislative Task Force on education funding reform, to complete a report with proposed legislation by Oct. 1, 2018, and forms a task force to study additional school choice accountability. Funds the New Teacher Support Program and the Future Teachers of NC to provide professional development to new teachers and high school educators. Increases the net appropriation for NC Promise by $11 million to support additional enrollment at participating universities offering $500/semester tuition in North Carolina. “And by increasing salaries for our faculty and staff and making a greater investment in our Faculty Retention Fund, we will be able to reward and retain the top talent so critical to our enterprise,” Spellings continued. Transfers North Carolina’s apprenticeship program to the community college system to promote career technical education and job placement. Reserves $46.6 million to meet UNC system enrollment growth this fall. Pays for 800 additional full-time equivalent students in the state community college system this fiscal year: $4.9 million. Provides the UNC system with $10 million to support modernized data collection and integration projects that support student success, accessibility, retention and graduation rates.